I’m an all-weather reader, and although my escapist genre of choice is romance, I can read, evaluate and review almost anything. The only genre I’ll stay clear of is horror, and I’ll promptly explain why. About ten years ago, I collaborated with a Greek publishing house as a translator for an imprint called “Kolasi” (“Hell”). Yes, it was a horror imprint. The first book I was assigned to translate was “The Sleepless” by Graham Masterton. 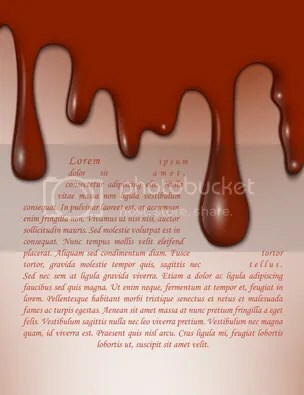 After dwelling in the author’s head for months, trying to twist my Greek words to serve his twisted vision of explicit torture and unimaginable physical pain, I decided I was done with that for life. Now, when I started my author platform building, I thought that romance would be the most overpopulated genre in indie publishing. I was wrong. Soon, I found myself happily connecting with wonderful authors from all walks of writing life, and now the only criterion I apply when I move on from connection to actual interaction and “paying it forward” is quality online conduct and professionalism. 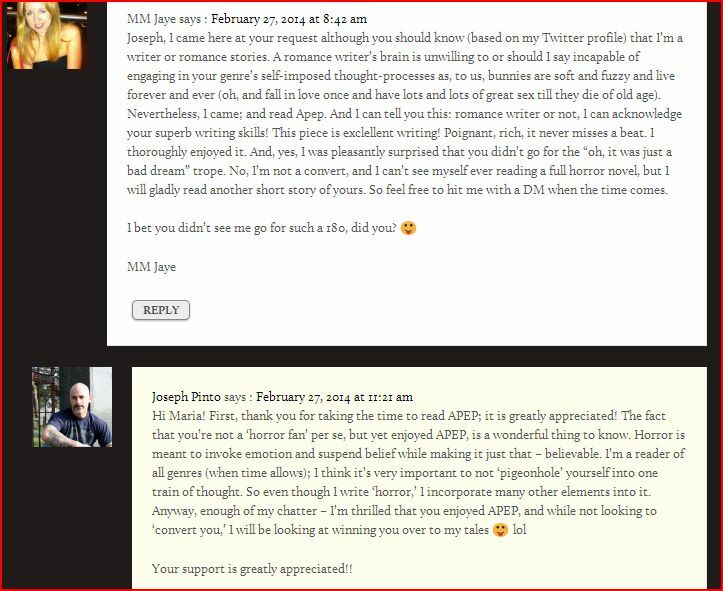 So when Joseph Pinto, a horror writer, sent me a personalized DM, politely asking me to check out his horror short Apep, I did, although I was more interested in checking out Joseph’s writing skill than letting myself be exposed to the story’s basic elements. Truth be told, Apep is expertly written—poignant, evocative, graphic but not raw and very cleverly plotted. I ended up enjoying it and left a relevant comment with a disclaimer, which resulted in a brief and enjoyable banter between me and the writer, as you can see below. Now, wanting to test Joseph’s claim that we shouldn’t be “pigeonholed” into one train of thought, I told him about “Web of Love”, the tiny Valentine story that I had recently published on Writersky. Joseph reciprocated, read it, talked it up in a tweet and the result? “Web of Love” became the most viewed story on the platform, exceeding 600 views! Well, it had been second most viewed, but it did need the extra boost. The irony? Up until then, the most read story was a horror piece! Lesson learned: “Pay it forward” yields gold, even when you push yourself outside your comfort zone. The only currency you need is a well-honed instinct (not all people mean well), goodwill, and positive energy will start bouncing off walls! If I piqued your interest, and you’re willing to read Apep, the link is here. For a softer-toned, beautiful post written by Joseph Pinto, read Wings. If you have your own “pay it forward” success stories, I’d love to hear them. Maria, thank you very much! I am so humbled that you would make mention of my work in your blog. I’m always looking to expand my audience, and it’s a reward to have ‘non horror readers’ appreciate my work (as you know lol). But I won’t expand at the risk of exclusion. By that I mean if anything else, I am loyal to the people and friends who help me. I’ll never say ‘hey, read my work…hey, buy my work’ while ignoring their own. So knowing that in some small way I aided the views of your story is a great feeling! Another author friend, who writes Urban Fantasy, wanted to do a review swap. I suggested she contacts you, and explained you write romance. Her first reaction was, “I’ll gladly read her book, as long as it has no graphic torture/child abuse descriptions in it”. To which I could only reply, “what kind of romance have you been reading”?? Which reminds me, I have someone to contact… I can’t keep up, Nicholas! Have been blogging while cooking, giving my little one a bath, and doing all sorts of things. Thanks for stopping by!